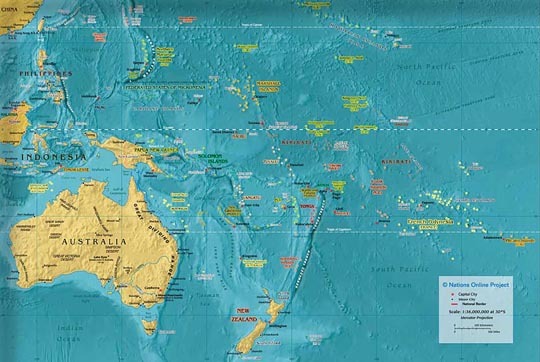 The 2010-2011 year is the Year of Oceania, YO. Students will delve into the rich history of our globe from the Philippines and Hawaii in the north and Australia and New Zealand in the south. Events will be scheduled throughout the academic year and include a Luau, lectures, crafts, a film-and-discussion series, and many others. The 2011-2012 year will be the Year of Ireland and Irish Heritage! The 2011-12 "Year of" committee if forming now, so if you would like to serve please contact Dr. Ann Smith at ADS@reinhardt.edu or 770-720-5892. April 7 - Spring Day - "Year of"-related events - 11 a.m. - 3 p.m.
A fat, ugly creature is rapidly taking over Australia! The Cane Toads were imported by the sackload from Hawaii to Australia in 1935 in an attempt to rid the country of the Greyback beetle, which was rapidly destroying their sugarcane crop. The Cane Toads adapted beautifully to their new surroundings. Problem was, the beetle could fly and the Cane Toad couldn't. What the Cane Toad is unusually good at, however, is making more Cane Toads--thousands upon thousands more. If Monty Python produced a National Geographic special, it would be "Cane Toads!" Dr. Duncan Cole, Australian Consulate General of Atlanta - Oct. 20, 2010 – Bannister Glasshouse - 2 – 3:45 p.m.
Dr. Theresa Ast, Professor of History - “The Island of Colorblind” - Oct. 28, 2010 – Hill Freeman Library upper floor - 2 – 2:45 p.m.
As additional events are scheduled, details and information will be added to this web page. Unless otherwise noted, community members are invited to attend these programs free of charge. Click image to see larger map (scroll down on the linked page) at http://www.nationsonline.org/oneworld/map/oceania_map.htm.